This food supplement contains a unique combination of certified organic Aloe Vera, Lactobacillus Acidophilus and a carefully selected blend of botanical ingredients. 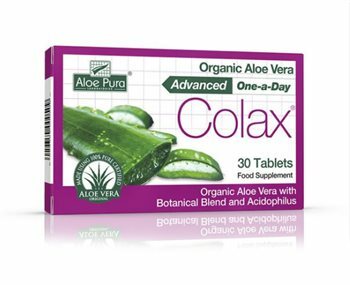 Aloe Pura Colax Advanced tablets provide fully certified and organic Aloe Vera combined with a formulation of botanicals and millions of gastrointestinal probiotic cultures. Bulking agents (Microcrystalline Cellulose, Dicalcium Phosphate); Aloe Vera (Aloe ferox whole leaf) powder, Cascara (Rhamnus purshiana bark) powder, Alder Buckthorn (Rhamnus frangula bark) powder, Senna (Cassia angustifolia fruit) powder, Aloe Vera (Aloe barbadensis juice) extract 100:1), Aniseed (Pimpinella anisum fruit) powder, Fennel (Foeniculum vulgara seed) powder, Gentian (Gentiana lutea root) powder, Liquorice (Glycyrrhiza glabra root) powder, Mallow (Malva sylvestris leaf) powder, Peppermint (Mentha piperita leaf) powder, Rhubarb (Rheum officinale root) powder, Dandelion (Taraxacum officinalis root) powder, Anti-caking agents (Magnesium Salts of Fatty Acids (Veg Origin), Silicon Dioxide), Lactobacillus Acidophilus. Take one tablet (vary quantity according to experience - maximum four tablets daily), before bed. Do not exceed the stated recommeded dose. No artificial flavouring or colours. Consult a healthcare professional before use if you are pregnant, breastfeeding or taking prescribed medication. Made using organically certified 100% pure concentrated Aloe Vera so you can be sure it meets the highest quality standards. The Colon Cleanse ADVANCED Tablets are one of the best product to help digestion if need be. It's a sure method to overcome bloated feelings and to make work your colon again normally. These tablets never caused diarrhoea to me. This good experience only applies to the ADVANCED Colon Cleanse Tablets. I also tried the ones that are not called ADVANCED, but they didn't work. This is the first product I tried cramps free and I think this says it all. It is not exactly taste free, but if taken on a full stomach it won't be such a great issue. I take one in the mornings and one at night, they work wonders and no more bloat and cramps for me. Beats Ortis by far, price and expectation. Very well recommended. All I know is that it works well. I started using this product a few years back and don't want to live without it--especially when traveling. It keeps me regular and feeling less bloated and weighed down. I highly recommend it! One tablet a day is all you need. When traveling it keeps you from becoming frustratingly constipated. I recommend for those occasions to take 2 or 3. Takes about a day to kick in but not always. Sometimes less. I've been taking this product for 5 days, normally I empty myself once or twice a fortnight, I'm going nearly every day, think I might try 2 tablets and see how it goes. Best natrual remedy I've tried. On a more long term basis I'm going to use juice then go back to this when in need of a good cleanse.